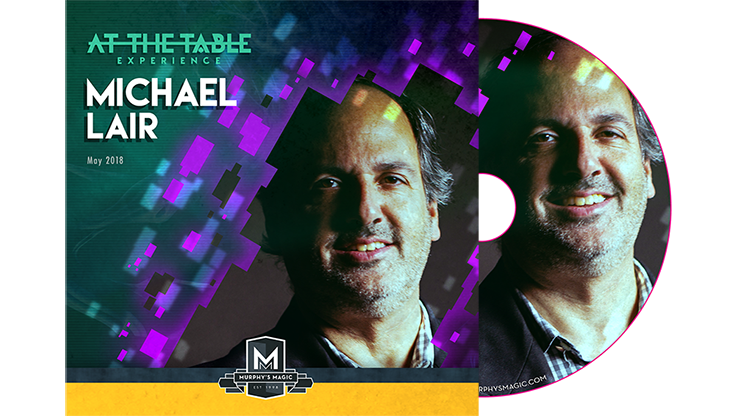 Today, when you order "At The Table Live Michael Lair - DVD", you'll instantly be emailed a Penguin Magic gift certificate. You can spend it on anything you like at Penguin, just like cash. Just complete your order as normal, and within seconds you'll get an email with your gift certificate. With over 3 decades of performances and creation under his belt, it's no surprise that Michael Lair is a skilled lecturer and magic innovator. First place winner of IBM's 2009 Originality Contest, Michael brings some of his best secrets and most requested tricks to the table. You will learn visual magic routines that are perfect for close-up and stage. He even shares new material that he still uses in his stand-up routine. If original out-of-the-box thinking appeals to you, this is one lecture you do not want to miss! Arcandle! : A white, lit candle suddenly changes into a black cane. Mapped! : A ripped map instantly changes into a completely restored 24" x 36" world map. ClifHanger: A visual comedy bit to liven up your act. Sponge Poker: A red sponge ball turns into a red poker chip. Sponge Poker Finale: An amazing kicker ending to the Sponge Poker routine. Jack in the Box: An out-of-the-box routine, where a Jack in the Box jumps out and restores a torn card. Ring, Rope, & Chopstick: Placed in a rope and secured by two spectators, a ring penetrates the rope with nothing more than magic and a chopstick. Dimes! : Michael Lair's twist on a four-coin matrix routine. Reversal of Fortune! : A unique take on the fortune teller fish. Big Coins! : It starts with a completely empty hand and, in a flash, a big coin appears from nowhere. It's Michael Lair's big coin routine that ends in the most unbelievable way-a shower of confetti. Candle Trilogy: A color changing candle routine, where candles appear, disappear, and change colors.